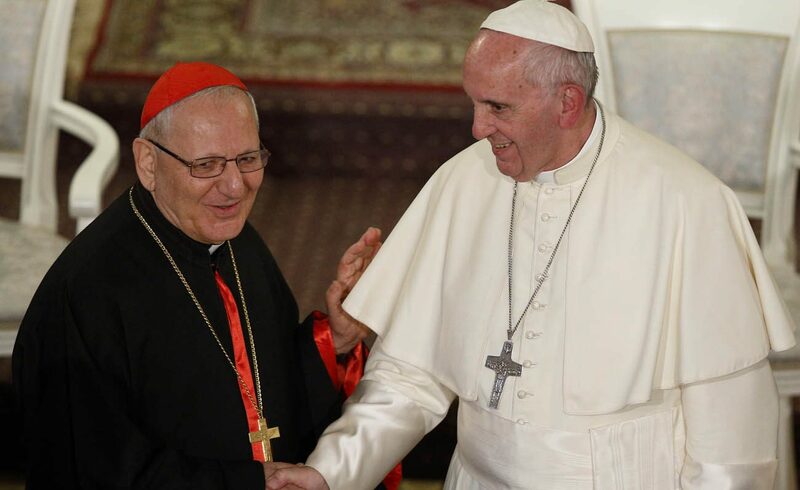 UPDATED – BEIRUT (CNS) — Pope Francis’ naming of Chaldean Patriarch Louis Raphael I Sako as cardinal is a gift to the Chaldean Catholic church, which has been struggling in the face of terrorism, said an Iraqi archbishop. “He’s transparent in his way to guide our church and with his presence. He’s a very special man, spiritually,” Archbishop Mirkis told Catholic News Service, adding that under Patriarch Sako’s leadership there has been a particular focus on new vocations. “The Catholic Church is a global church. We are Catholic and this nomination is a sign of our catholicity” as Chaldeans, Archbishop Mirkis added. Cardinal-designate Sako’s appointment follows the announcement earlier in May that the Vatican has formally opened the cause for canonization of Chaldean Father Ragheed Aziz Ganni and three deacons who were gunned down in Mosul, Iraq, in 2007. Chaldeans are the indigenous people of Iraq, whose roots trace back thousands of years. “Through me, (Pope Francis) is giving a message to everyone to be at a level of tolerance, forgiveness, reconciliation, and finishing with wars, conflicts, because there is no future with that. The only future is to sit together, to dialogue, (in order) to realize peace and stability,” he said. “We have to be united. When we are one — one position, one speech and one clear vision — then we can survive and we can also witness our Christian values. Otherwise, we are just, excuse me to say, ‘small groceries’ here and there, and very weak,” Patriarch Sako said. Before the American-led invasion of 2003, there were more than 1.5 million Christians in Iraq. More than half of that Christian population has migrated due to discrimination, threats, abductions and especially the expulsion of some 120,000 Christians from their homes in Ninevah Plain by Islamic State in 2014. Cardinal-designate Sako has worked tirelessly for peace, coexistence and national reconciliation in Iraq and the Middle East, as well as for unity among churches. Lamenting the exodus of Christians from Iraq, he repeatedly has appealed to the central government and local authorities to guarantee them a peaceful future in their homeland. In January, the cardinal designate was nominated for the 2018 Nobel Peace Prize. His nomination, submitted by the French Catholic association L’Oeuvre d’Orient, was later accepted by the Norwegian Nobel Committee. Cardinal-designate Sako was born in Zakho, Iraq, July 4, 1948. He studied in Mosul and was ordained a priest there in 1974. He holds two doctorates: one in Eastern patristics at the Pontifical Oriental Institute in Rome, the second in history from the Sorbonne in Paris. After studying abroad, the cardinal-designate returned to Iraq in 1986, where he served as pastor for 11 years in Mosul. During the U.S.-led embargo of Iraq, he and several physicians and pharmacists opened a dispensary for the poor. Between 1997 and 2002 he served as rector of the Patriarchal Seminary in Baghdad before returning to his diocese of origin to serve as a parish priest. In 2003, eight months after the U.S.-led invasion of Iraq, he was appointed archbishop of Kirkuk. He was elected to lead the Chaldean Church in early 2013, and Pope Benedict XVI formally recognized the election soon after.